My Very First Blog: Happy Birthday To Me! Today is Dec 1st which happens to be my birthday! So Happy Birthday to me! Haha! I don't usually celebrate birthdays. But last night, I had a birthday dinner with my group of blogger and twitter friends at Pasta Zanmai in Mid Valley Megamall. From the left in clockwise direction : Saucer, Witch, Eric, Grey and Erika. It's only my third time at this restaurant and I think I really like the food here. Well, at least it's much better than Sushi Zanmai. I really don't get what's up with the long queues at Sushi Zanmai! I had the Mini Tempura Prawn Sesame Pasta and Unagi on Rice served with Miso Soup. Ooh!! 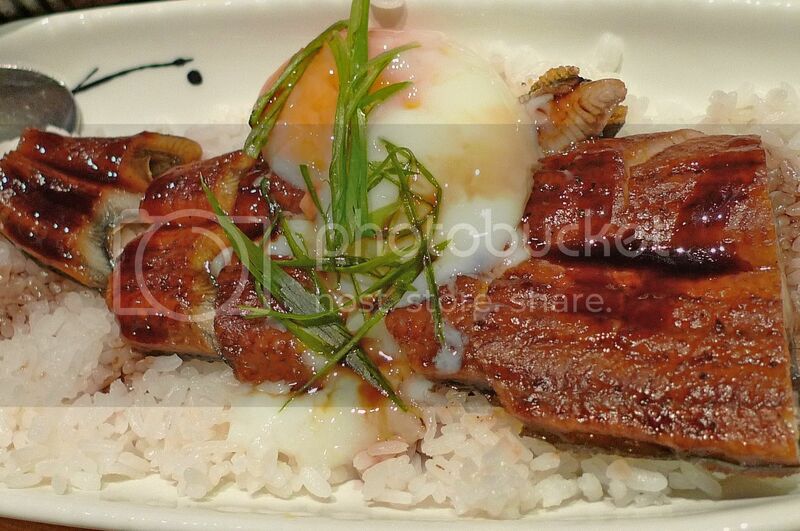 I just love the unagi meat! 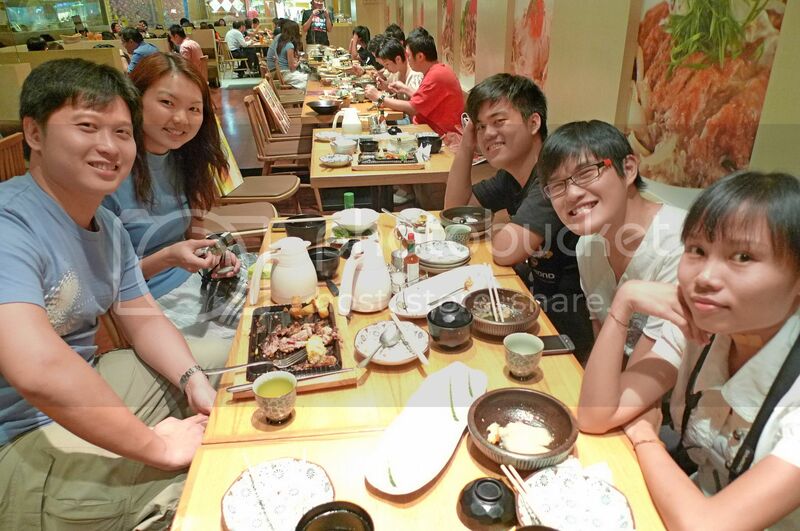 I am now dreaming of eating unlimited unagis at Japanese buffets. Yum! 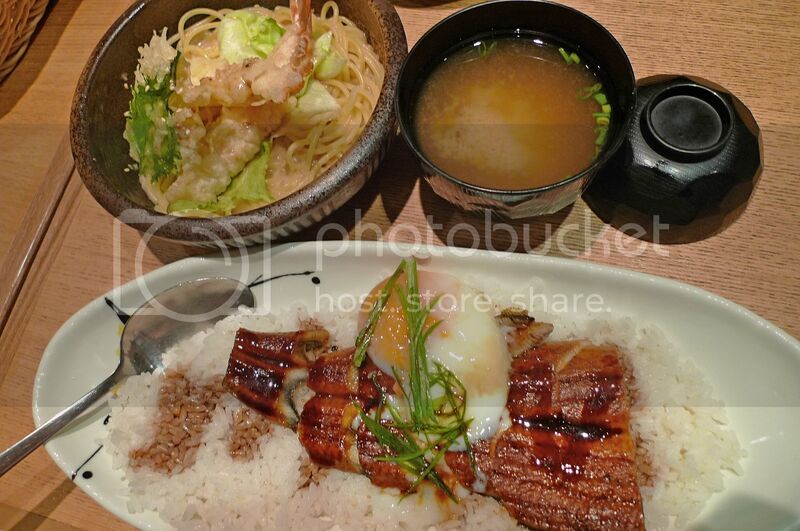 The egg on the rice added to the enjoyment of this yummy meal! 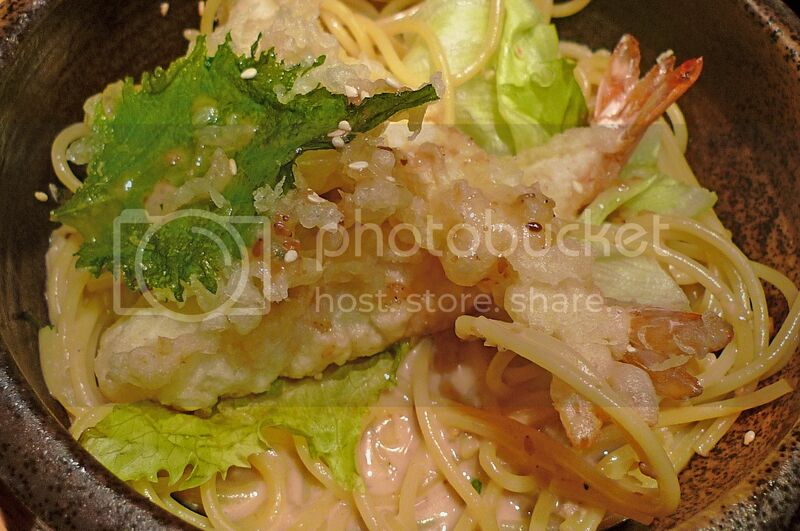 The tempura prawns were nice! And the pasta was pandalicious (read delicious) with its sourish sauce. 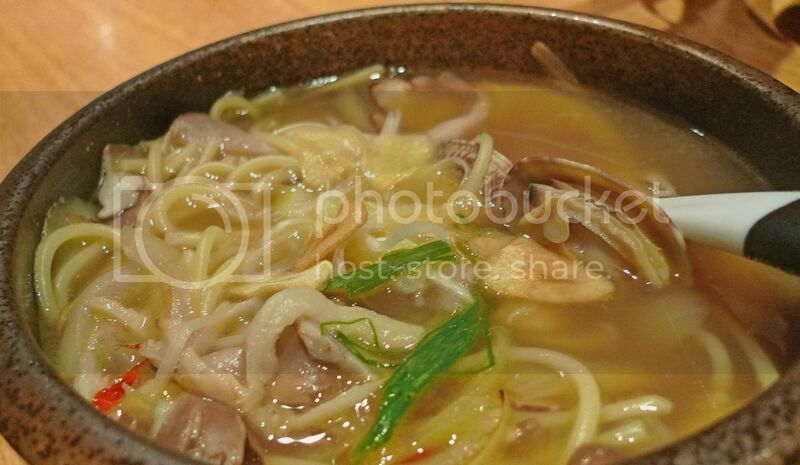 How clever of Pasta Zanmai to fuse Japanese food with Italian pasta! 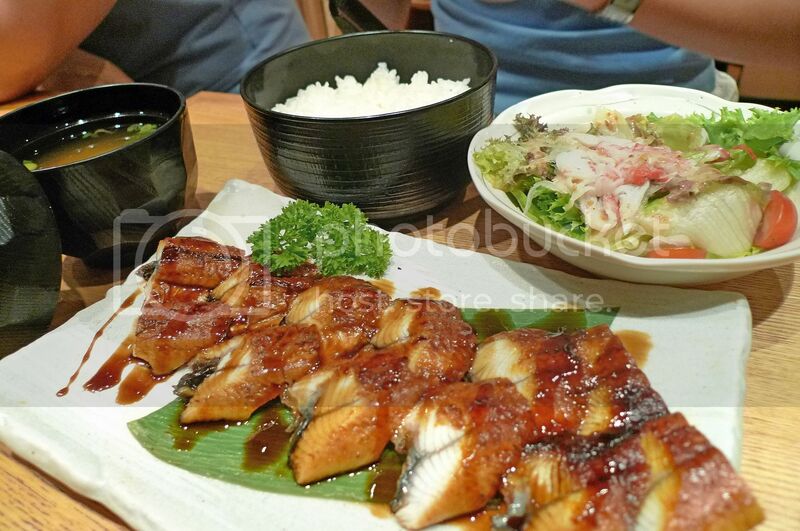 Oh by the way, you can also order unagi with pasta instead of rice - taste just as marvellous! Both Erika and Grey ordered the same set as mine. Witch ordered the Unagi Kabayaki set. 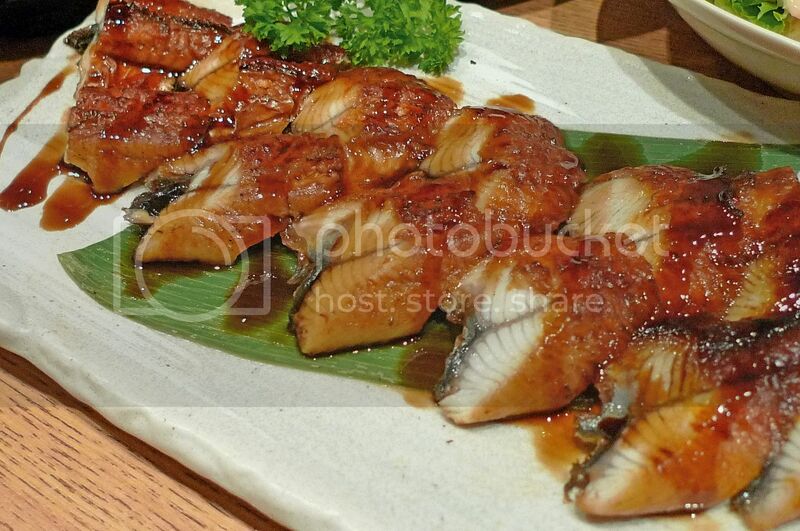 The unagi with kabayaki sauce looks damn delicious! I will surely enjoy eating them! 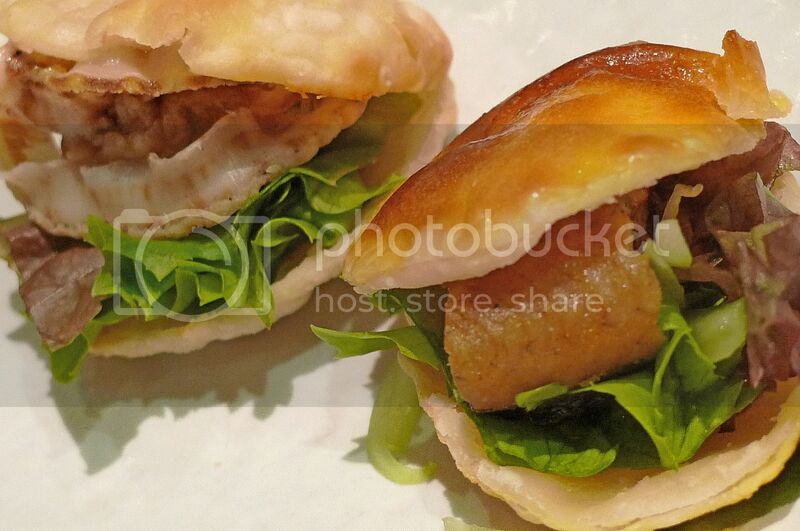 Eric ordered the Mini Shortneck Clam Soup Pasta and the Mini Grilled Chicken Cutlet on Rice. But I forgot to take picture of the grilled chicken! Oh well, here's his clam soup pasta. 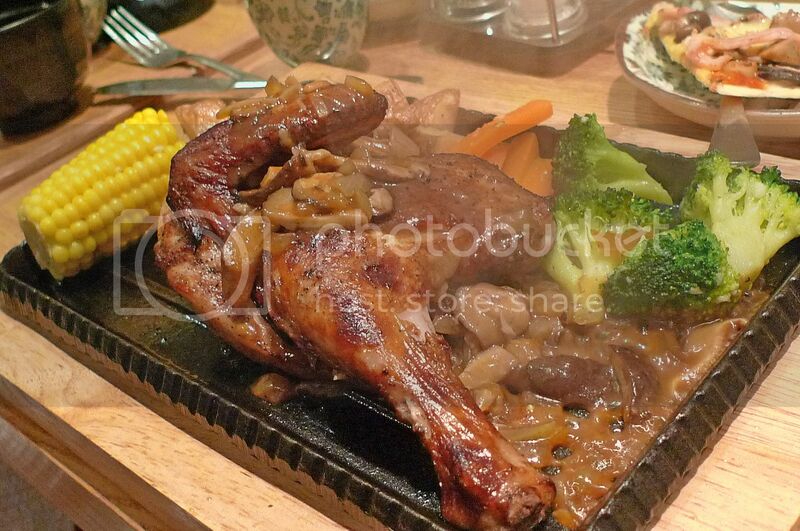 Saucer ordered the Sizzling Grilled Spring Chicken with Mushroom Sauce. I tasted a little bit of the chicken and it was not bad. 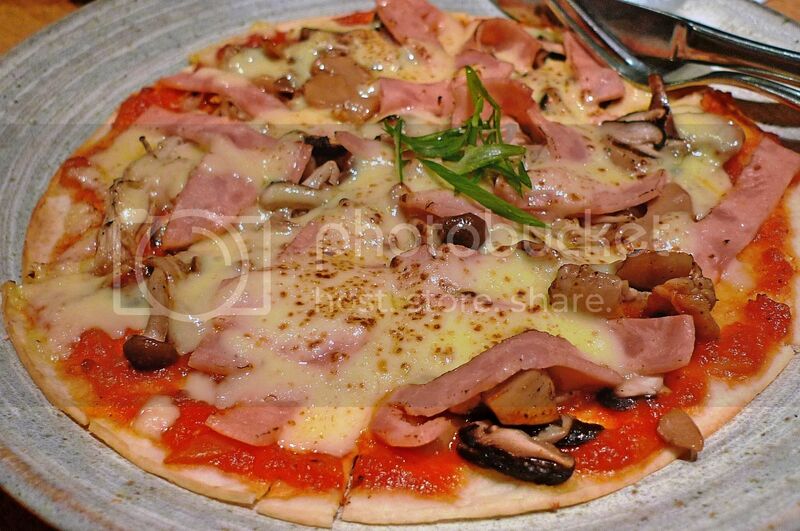 We also ordered Turkey Ham and Japanese Mushroom Pizza for all to share. But the pizza was not really that good to me. Suffice to say I have eaten better pizzas. However, this pizza was recommended by the waitress so I must now remind myself not to order items that are recommended to us in future! 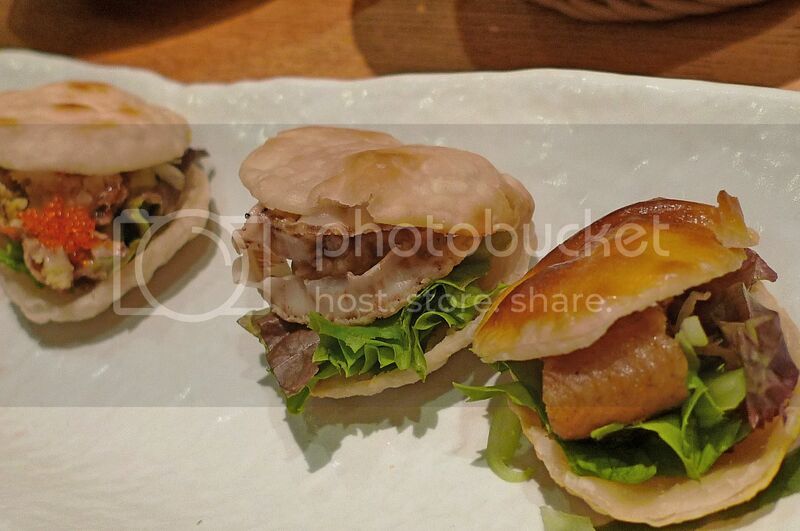 Lastly, we also tried these Assorted Mini Canapés. They were supposed to be appetizers, but I ate them last. Haha!! Didn't quite like them but they look cute, don't they? It's always nice to be the birthday boy cos I can eat for free! Haha! Come to think of it, I should have exploited it further by ordering some expensive fancy drinks and eating some desserts as well! But I decided not to cos my friends could do the same thing to me when it's their turn to be the birthday boy or girl! Or worse, they would not want to celebrate my birthday ever again! So better not be too greedy. Haha! Now let me ask you a quick IQ question : Who among the five here is abnormal? Haha!! yummy fudams for the panda! Do you know this birthday song Panda? Once again has come your birthday, once again has come this year! What a loving gift from Jesus - He has given you one more year..Happy time your birthday, happy time this year! What a loving gift from Jesus - He has given you one more year..
LOL Panda wanna eat a lot..but dun you know guys/males are more prone to CVD when comes to eating than females?hahaha..
gagay, thanks! Err...I don't know that birthday song. I only know one birthday song and it is the one Monica and you just sang to me and with the word "Panda" in it. LOL!! Umm, the answer to your question is none of the people in the pic! That's the way it should be! LOL! Have a good one, buddy! david funk, thanks David! So none of the people in the pic is abnormal? Haha! i really think the food there is nice, and yeah, i also don't like sushi zanmai as things are more common but always with long queue.. Happy Birthday bro! May all ur wishes come true! Yes, those orbs in the picture at my blog are supposed to be angels some say! Happy Birthday, Foong! Many happy returns! One year older, one year wiser.. Happy birthday! How young are you? Come come, let Uncle Shingo give Foongpc a muack muack! oh my Foong... Happy birthday....!!!!! I wish all the success and may you have many more birthdays to come... Cheers!! he he so nice eh my comment got music notes and what not! everyone is funny except one..so is he abnormal? I wish you more years of happiness and travelling! Happy Belated Birthday To YOUUUUUUUUU! What can I give you for your bird-day? What you want? 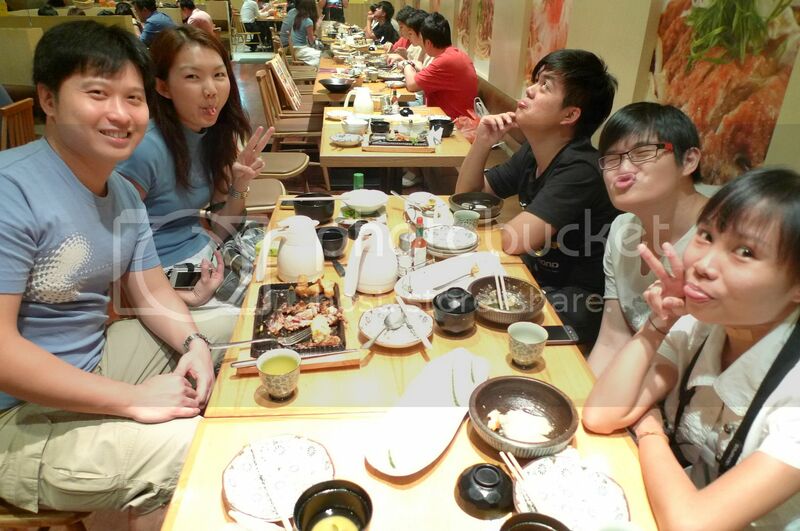 You guys had yummilicious food spread and you were so lucky to be treated! Good that you were not greedy to bully them with expensive orders! Many Many Happy Returns of the day.... Foods are so yummy.. HAPPY BIRTHDAY again Foong! Glad that you enjoyed your dinner!! You could have ordered more since you're the birthday boy, but don't blame me if I suddenly became 'busy' in your next year's bday :P Hahaha..
Erm, is Saucer the one abnormal? LOL! If everyday is your birthday - very good because can enjoy nice food everyday. I like their pizzas except the one that we ate that night! eric lee, yes, you are right!! Haha! lina, thanks for the birthday wish in Korean language! Watching lots of Korean pretty boys nowadays? Haha! poorprince, thanks! Keep wondering about my age, haha!! happysurfer, thanks! Definitely one year older, not sure about the wiser part though LOL! mei teng, thanks! This is not my first time announcing my birthday you know. As to how young, I am younger than next year. Haha!! You like unagi too? I absolutely love them! Haha!! Wait till Grey see your comments calling him Rubber Face! I am always late since I had my baby out so pardon my delay but here's my warm greeting for you..
Wow. Food looks good. I think KL food is great!